Choctaw Corner was a former town in Clarke County, Alabama. It is named for the nearby Choctaw Corner, which marked the border between the native Choctaw and Creek peoples prior to the Indian removal. The community was one of the earliest settlements in the county. Choctaw Corner had a post office by 1850. It was a prosperous community during the antebellum period and for many years afterwards. Then, when the railroad from Mobile to Selma came through Clarke County in 1888, less than 2 miles (3.2 km) southeast of Choctaw Corner, the town began to die. A new town, Thomasville, Alabama, developed on the railroad. The people in the older community saw the potential of the new town as a railroad shipping point and were among the first people to move there. The former town of Choctaw Corner slowly declined into nonexistence and was later enveloped within Thomasville’s city limits. It is now remembered primarily by Thomasville’s city cemetery on its western border, called Choctaw Corner Cemetery. Wikipedia contributors, “Choctaw Corner, Alabama,” Wikipedia, The Free Encyclopedia, https://en.wikipedia.org/w/index.php?title=Choctaw_Corner,_Alabama&oldid=838073156 (accessed January 31, 2019). Suggsville, Alabama is an unincorporated community in Clarke County, Alabama. It was laid out as a town in 1819 at the crossing of the Old Line Road and Federal Road. The name was chosen in honor of a local storekeeper, William Suggs. The town had many residences, stores, and male and female academies prior to the American Civil War, but declined rapidly in the post-war period. Suggsville is located at 31.58960°N 87.69305°W and has an elevation of 381 feet. As of the 1880 U.S. Census, Suggsville as an unincorporated community had 134 persons, then the 3rd largest recorded community in the county behind Grove Hill and Choctaw Corner, today’s Thomasville. 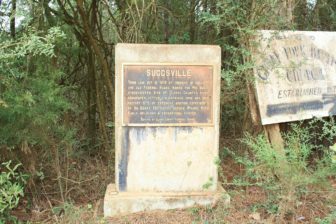 Credit: Wikipedia contributors, “Suggsville, Alabama,” Wikipedia, The Free Encyclopedia, https://en.wikipedia.org/w/index.php?title=Suggsville,_Alabama&oldid=820666738 (accessed January 30, 2019).